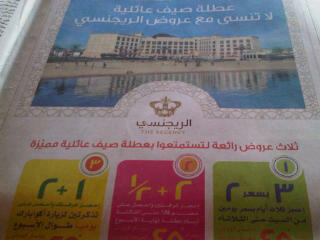 The new Regency Hotel has great summer offers on their rooms, they start from just kd45 a night. Check it out. The hotel has like 3 beaches and 5 pools, and is totally brand new. Ako private beach w private pool 7ag el ladies only… Madri 3an ba7arhum, bs I don’t think elba7ar is nice over there. لو عندج اهني ميزة تزيل الصور جان نزلت لج صورة المسبح ضخم ! لوووول… سالفتج تضحك…. و امبيه، هواء تيفون. هذا مصيبة، الله حفظكم….